On Friday, we removed Anthony’s PICC line and discontinued the TPN. That’s the good news. Unfortunately, the same day he spiked a fever and became congested. On Saturday, it became clear that we had a very sick boy on our hands. Because of his congestion and fever, he was started on antibiotics via his J-tube. We were hoping to treat him at home. On Sunday, Anthony went into severe respiratory distress, more than what one would expect with pneumonia. Obviously, this was more than we could manage at home. 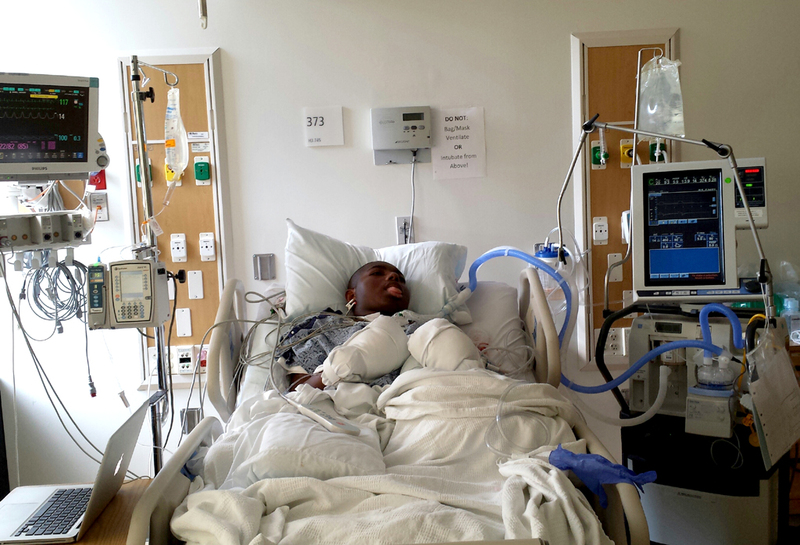 We brought Anthony to the ER, and since he was in respiratory distress, the ER team went right to work on him. 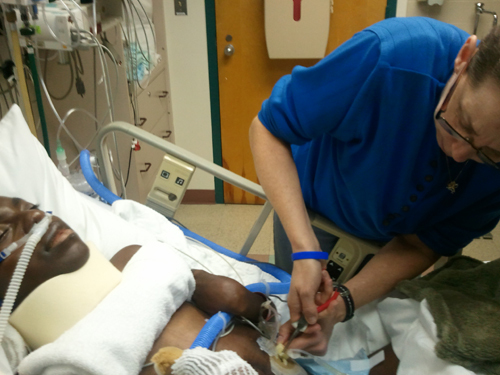 They were ready to intubate him when a respiratory therapist tried putting his head back and holding his mouth closed. His breathing got better right away. They put a backward collar on him, the type you’d wear for whiplash, put a towel under that to keep his mouth closed. At this point, it was becoming clear that most of Anthony’s distress was caused by a mechanical airway obstruction. We knew he had obstructive sleep apnea, but he was never obstructed to this extent. Maybe an upper respiratory infection had exacerbated the problem? His chest x-ray was “unimpressive” meaning he did have some congestion, but not terrible (when doctors say something is impressive, they mean it’s bad). His WBC was only slightly elevated and his blood gases fairly good considering his distress. He was started on IV antibiotics and admitted to the PICU. Now the question is do we trach him? It is pretty obvious to us that a tracheostomy will solve his obstruction problem. 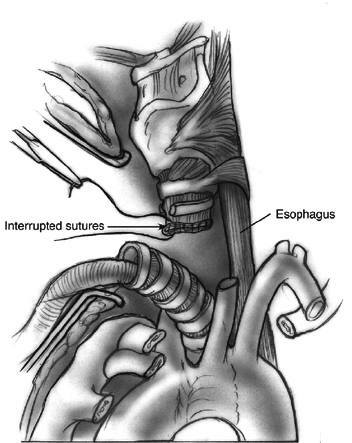 Of course a tracheostomy means another surgery, not to mention what’s involved caring for a person with a trach (I happen to know someone who wrote the book on tracheostomy care). Over the past couple of days we have consulted with the PICU medical team, the surgical team, the infectious disease team, a pulmonologist and an otolaryngologist. 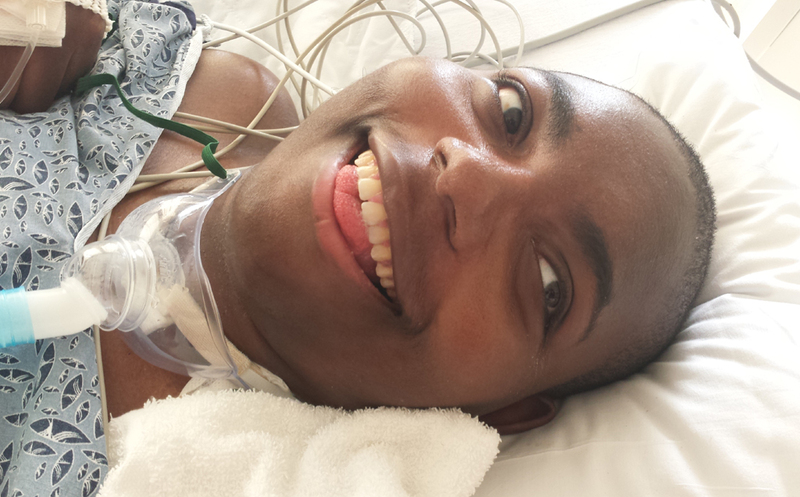 They all agree – as do Rich and I – that Anthony needs a trach, the question is when. He had a fever of 101 this morning, so there is something going on with him, but it’s not exactly clear what is causing his fever. There was no pneumonia, all cultures are negative so far (blood, sputum, stool, urine). He is on 3 different antibiotics. They want him to have at least 5 more days of antibiotics on-board before they do the surgery. We are looking at possible surgery on Monday or Tuesday. Looks like he will be staying in the PICU until then, and then at least another week after the surgery. So, that is where we are at now. Below is a photo from Rich’s cell phone of me with my tools changing the clamp and dressing on Anthony’s J-tube. This is a new device that most of the staff have not seen before. I don’t want the nurses messing with it, because it’s too easy to damage the tube. Yes, I’m a control freak! LOL! 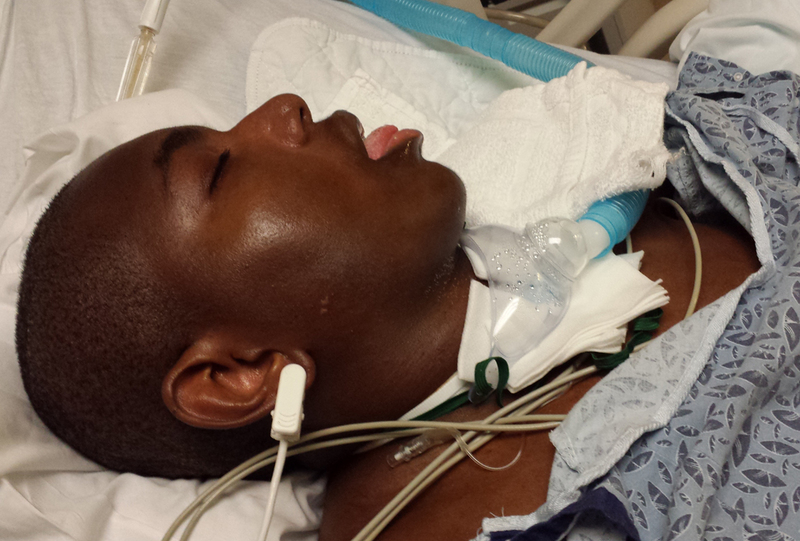 In the photo, you can see what is required to keep Anthony’s airway open until he gets a trach. Medically Fragile Children: Forgotten H1N1 Patients? I am an RN and mother of three sons who all have disabilities. I am also an advocate for children with complex health care needs and I network with parents of children from all over the US. Most of these children have tracheostomies, g-tubes and many are ventilator dependent and require 24/7 care. I am so thankful to live in Massachusetts where we have easy access to quality health care and medicaid waivers for children with disabilities and complex medical needs. But many people in other states do not get the help they need in order to care for their children at home. In some states, children are put on a waiting list for many years in order to get the help they need right now. It is not fair that a child is denied assistance, just because they happen to live on the other side of a state line. This is just one of many reasons why I support a public option and why I feel that this part of the bill must be included in order to have ‘real’ health care reform.